In case you missed the exciting news, it’s Guest Bloggers’ Week! 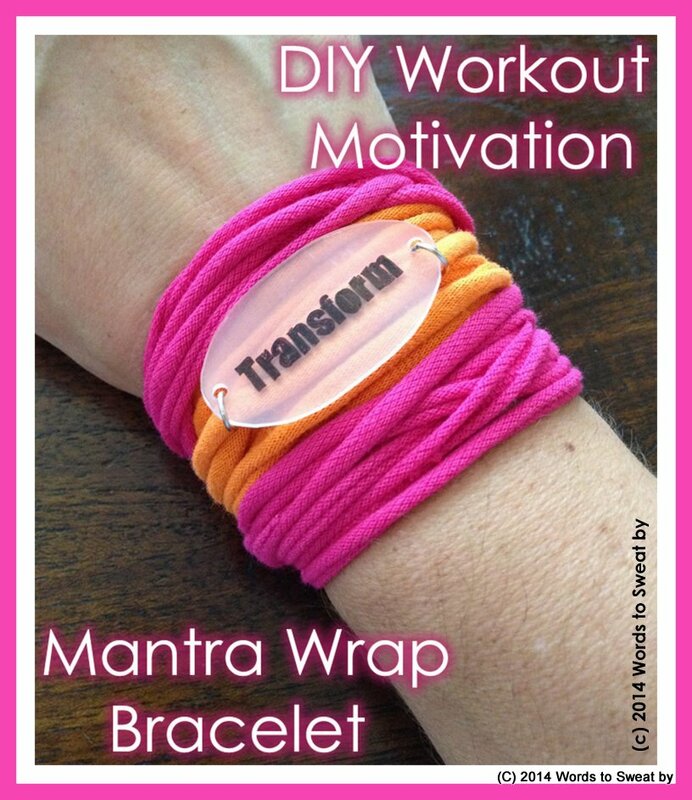 And today Dana Lardner — the CEO and Designer of Words to Sweat By, a company that offers fun and affordable motivational health and fitness accessories — is showing us how to make our very own DIY Workout Motivation Mantra Wrap Bracelets. Yeah! When you find your fitness groove, it’s almost as though you gain superhero powers. You can run like the wind, leap tall boxes in a single bound and contort yourself into crazy poses. And every superhero must have her gear and gadgets, right? But even Wonder Woman has to decide how to rock her workout wear without blowing the budget that also goes to race bibs or gym fees. And some days, Wonder Woman also loses her motivational mojo. So what’s a super woman to do when her wallet and her workout motivation need some TLC? She goes green with this DIY workout motivation mantra wrap bracelet! Supplies for DIY workout motivation mantra wrap. Plastic container (Plastic #6 only). You’ll find most #6 plastic containers in the packaged bakery goods section at your local grocery store. Or, that take-out sushi habit you’ve been trying to break? Well, that will come in handy because most of those containers are both the right plastic and a great size for this project. Remove all the stickers and wash and dry it thoroughly. Old cotton shirt or cotton jersey knit fabric. Use an old colorful race shirt or, go to your local craft store and purchase 100-percent cotton jersey knit fabric in your favorite color. You can also show your FBG pride and use the signature color. Rotary cutting set and scissors. The rotary cutting set isn’t a necessity, but it does make cutting the fabric a lot easier. If you don’t have a rotary cutting set, you’ll need to mark the wrap bracelet strips with a white chalk pencil so that you can cut straight lines easily with the scissors. Plastic charm templates. Since the #6 plastic behaves like a shrinky dink, getting the proportions right can take time. So to make it easy, here is document that has an oval and a square template for you to cut out and use for this project. Standard hole punch. You’ll need a standard ¼-inch hole punch to punch the holes. Anything smaller will be too small for the jump rings necessary to attach the charm to the wrap. Black Sharpie pen. Using black means you will have the right contrast when the colored wrap is underneath the charm. Printed mantras. Print up some of your favorite (but fairly short) mantras on a piece of paper to use as a tracing template. It’s best to use a font that has clean lines and edges so that it will be easy to trace and to read once it shrinks down. When making the template, the font size should be between 50 to 80 point, depending on the font you use and the number of words included in your mantra. Cookie sheet and parchment paper. You’ll place the plastic on this to place them in the oven. Jump rings (size 7 mm). These can be found at most craft stores or here. Pliers. Dig into that tool box to find two pairs of pliers. You’ll need these to open and close the jump rings. Activate Workout Motivation Mantra Wrap! Print mantra tracing template. Head over to your computer and, using a Word processing program, print up some favorite mantras on a sheet of 8.5 x 11 paper. Remember to select a font with clean lines and edges so that it’s easy to trace. Remember, the words should be in 50- to 80-point font depending on the font selected. Print mantra charm template. While you’re still at the computer, print the plastic charm template, and then cut the shapes out to use as your guide. Preheat your oven to 350 degrees. You’ll want this to be warmed up and ready to go once you’ve finished making your shrinky dink-style mantra charm. Cut and trace your plastic mantra charm. Cut out and prepare your blank plastic charm. Take your plastic container and cut off the sides from the top so that you have a large working surface. 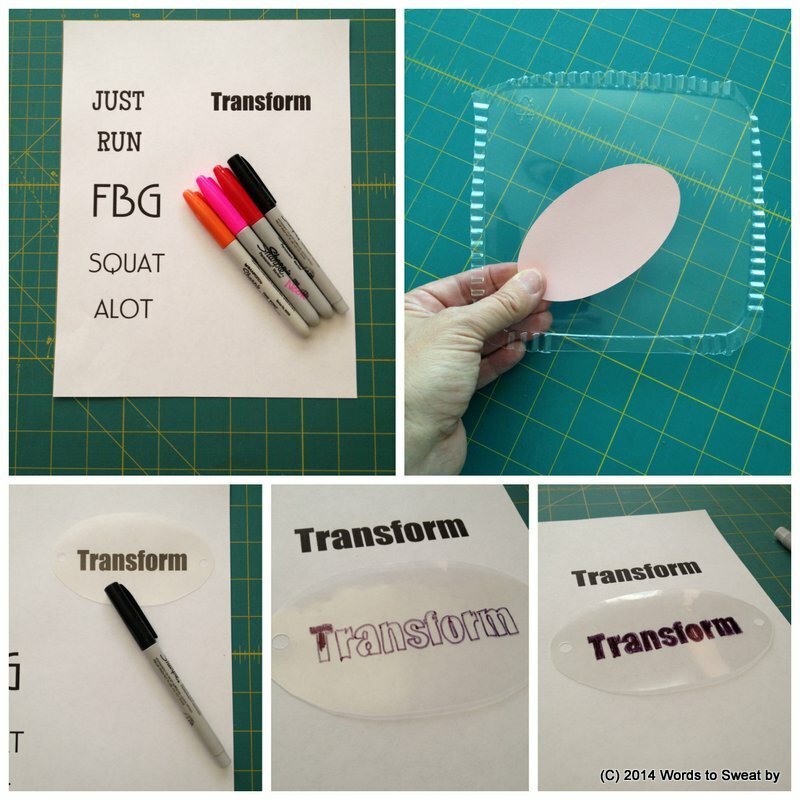 Select a shape template (oval or square) and then hold that in place over the plastic while you cut out your shape. 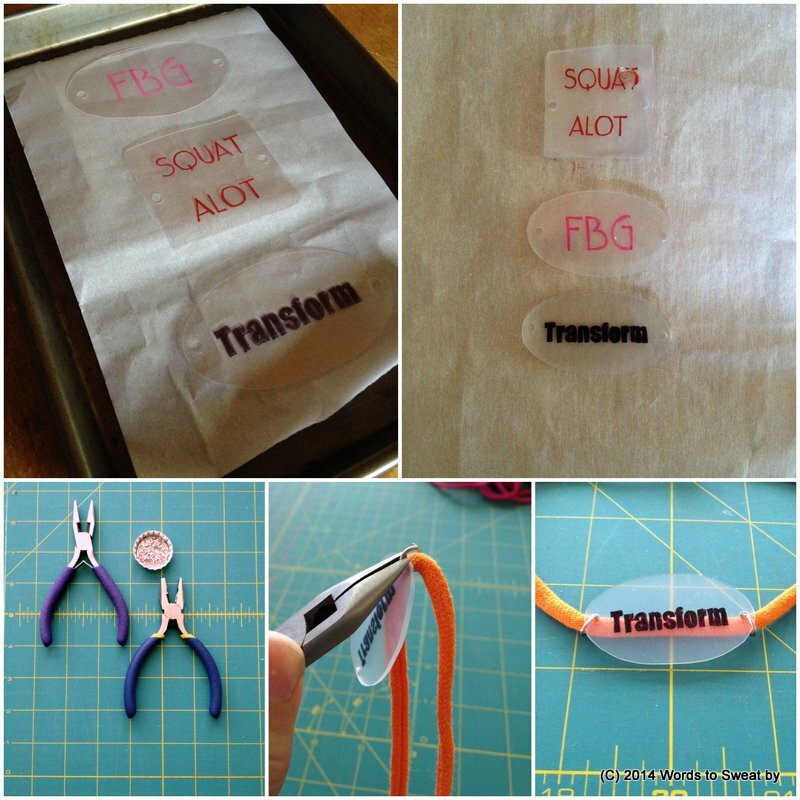 Use the hole punch to punch a hole on each side of the blank plastic charm. These holes have to be punched before you let the plastic shrink. Since you’ve already got the supplies out and the oven heated, it’s usually easiest to prepare several charms at once. Trace your mantra on to the plastic charm. Place your blank plastic charm over your printed mantra and trace the letters with your Sharpie. Finish the look by filling in the traced letters, making them as dark as possible. Cut strips of fabric to make your wrap. 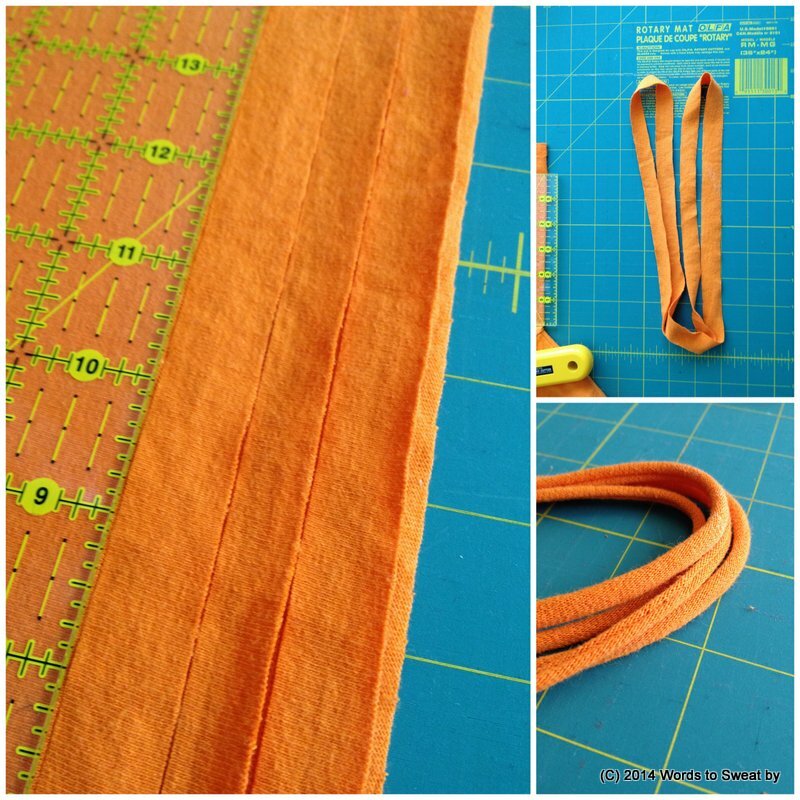 Cut ¾-inch strips of cotton fabric for bracelet wrap. While the charms are cooling, head on over to cut the wrap part of your bracelet. If you don’t have a rotary cutting set, you’ll need to use a ruler and a white chalk pencil to mark the ¾-inch strips. Cut as many strips as you need for the number of wraps you’d like to have on hand (or wrist, if we’re being literal). 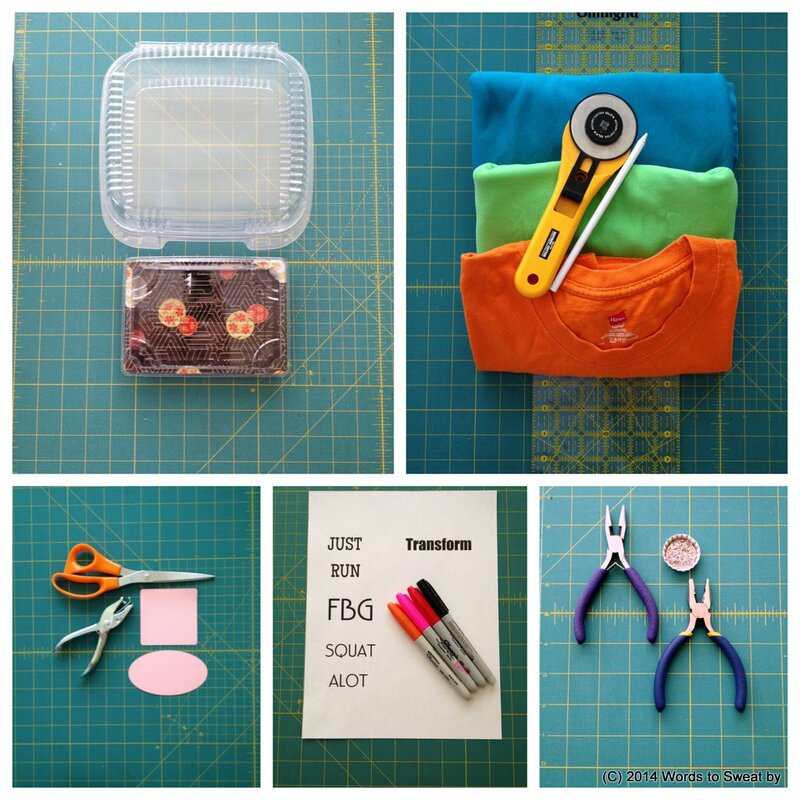 If you used an old T-shirt, you already have a complete circle to work with for the wrap. Just pull both ends away from each other to make it curl and give you more length to wrap. If you used cotton fabric, fold the fabric in half with the finished edges (AKA selvage) touching, then cut your ¾-inch strips. To figure out which ends are the selvage, jersey knit fabric finished ends typically have little dots poked through it. After cutting your strips, tie a knot at the finished ends to make a complete circle and then, pull the ends away from each other to lengthen the wrap. Set your wraps aside for moment to complete the charm. Shrink your mantra charm and attach it to wrap. Shrink (and harden) the charms. Place your plastic charms on the parchment-lined cookie sheet and then bake them in the oven for about 1 to 2 minutes. You’ll see the plastic curl and flatten several times before it flattens for good. Remove the cookie sheet from the oven and set aside to let the charms cool. Attach jump rings to charm. Take the pliers to open the jump rings slightly and then place a ring in each hole of the charm. Do not close them yet. Attach mantra charm to wrap. Attach the charm to the wrap by placing the wrap in the open jump ring. After getting the charm attached to the wrap, close the jump rings. Workout Motivation Mantra Wrap activated! Wear your workout motivation wrap bracelet proudly. 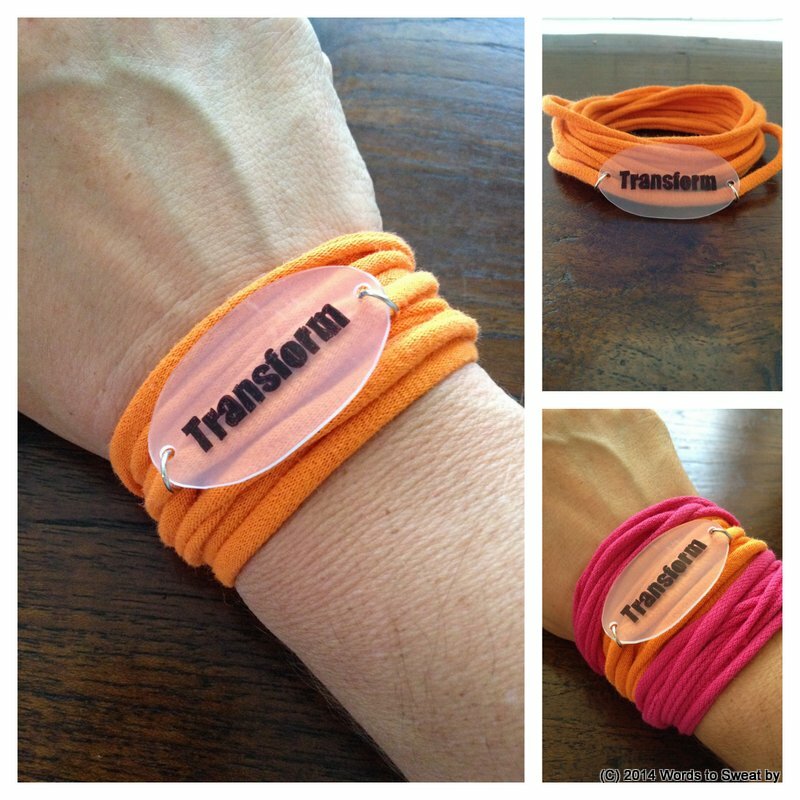 Wind the cotton strand of your motivational mantra wrap bracelet around your wrist as many times as it comfortable. Then, rearrange the charm to sit where you like (and can see) it best. You can also add an additional color wrap to make the look pop. Now that you’ve mastered the DIY Workout Motivation Mantra Wrap, you’ll be ready when the race, games or practice is calling! Please note: This tutorial and bracelet design are copyright protected and meant for personal use only. This is not to be used to create products for commercial sale. What an awesome DIY project. I love making jewelry too. Pinned on my DIY board. A lot is two words. Squat a lot is three. @digamba Thanks for the comment – you’re right and it was a hidden joke b/c I know how much Jenn likes Hyperbole and a Half’s “alot” which, from the illustration, would be super hard to squat.